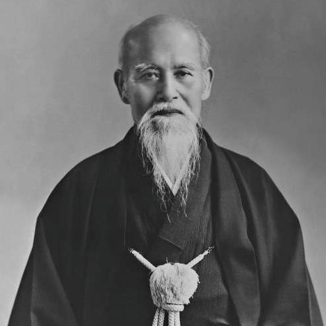 Morihei Ueshiba (植芝 盛平, December 14, 1883 – April 26, 1969) was a martial artist and founder of the Japanese martial art of aikido. He is often referred to as "the founder" Kaiso (開祖?) or Ōsensei (大先生/翁先生? ), "Great Teacher".